Way back when December came around for the dinosaurs do you think they would celebrate the holiday season too? 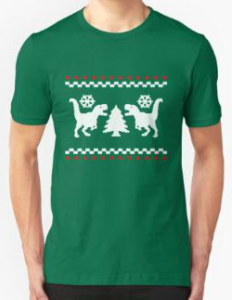 On this t-shirt you see evidence that yes dinosaurs like Christmas, find an ugly Christmas pattern of a series of red and white lines with a fun scene in the middle of two T-Rex dinosaurs with some snowflakes and of course a Christmas tree. The dinosaur print is available in a wide selection of men’s fitted sizes that range from Small to 3XL and choose from 17 different fun and vibrant colors to get the shirt in. It is made from 100% cotton to give you a super soft comfortable shirt to wear while also very durable to last you a long time.